Most of western North America has been severely grazed by cattle, causing grasslands to deteriorate and desert scrub expansion. Climate in arid and semi-arid regions is often typified by short, intense rainfall events which contribute to short-term flooding and erosion. Associated arroyo cutting occurs when ephemeral creek beds are carved into the floodplain when erratic overland flow occurs; this lowers water tables, depleting surface and subsurface water supplies (Betancourt and Turner 1993). When surface runoff is high, little recharge infiltrates to the basin aquifer, and high-intensity flow transports heavy sediment loads to channels, contributing to nonpoint source pollution in surface water bodies. People living in arid land environments all over the globe have developed ways to manipulate the earth’s surface to benefit and sustain agricultural practices via water harvesting. Archaeologists have discovered such features dating back to 27 B.C. and in the Madrean Archipelago Ecoregion (Sky Islands) to 1000 A.D. (Fish et al. 2013). Ecosystem Services of rock detention structures. The Madrean Sky Island Archipelago (Warshall 1995), part of the Basin and Range physiographic province, extends along the international border between the United States and Mexico, and has been identified as one of the most vulnerable areas to climate change (Seager et al. 2007). It is characterized by broad valleys or basins separated by steeply rising mountain ranges with independent hydrologic systems --classified as desert but renowned for its lush vegetation and diverse aquatic habitats, remnants from a time when the area was wetter. Federal agencies, including the US Forest Service, US Fish and Wildlife Service, US Parks Service, and Bureau of Land Management, are major land managers in this region, concerned with developing sustainable water supplies and vegetation for future generations and engage in best management practices. Additionally, private ranch owners have identified an immediate need for the adoption of proper conservation strategies in this area to control the eutrophication in downstream water supplies and to prevent further watershed degradation. As such, we have developed a series of scientific questions to address their impacts both qualitatively and quantitatively, and the list keeps growing (Fig. 2). Ecosystem Services derived scientific question that our project addresses. 1. Determine metrics to discern effectiveness of rock detention structures (quantifiable results). 2. Work with partners to determine where new structures should be…..
To reduce erosion and nonpoint source pollution (sedimentation in streams)? Our research is based on the hydrologic cycle that describes water as either: a) evaporated or transpired to the atmosphere; b) stored in the soil or in underground aquifers; or c) discharged to a nearby waterway (Fig. 3). Terrestrial monitoring documents the hydrological impacts of water harvesting devices and helps identify sites for future installation in Patagonia. Landsat Thematic Mapper satellite imagery and the derived Normalized Difference Vegetation Index (NDVI) values are being used to monitor changes in vegetation greenness at a desert wetland in San Bernardino. 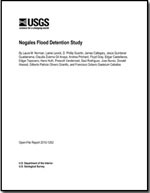 Hydrological geospatial models, including the Soil and Water Assessment Tool (SWAT) and the Kinematic Runoff and Erosion Model (KINEROS2) are being used (with Terrestrial LiDAR (T-LiDAR) datasets) to monitor changes in surface flow, infiltration, and sediment build-up at new check dams and detention features in Nogales, Patagonia, and at the Babocomari. T-LiDAR data and 2-D hydraulic models are also being used to examine changes in vegetation structure and channel dimensions in Patagonia. Hydrographs are developed using Continuous Slope Area methods to be input to calibrate watershed models for long-term predictions in the Chiricahua Mountains. The U.S. Geological Survey (USGS) is a Federal agency that conducts science about the Earth, its natural and living resources, natural hazards, and the environment. This research is part of the Climate and Land Use (CLU) Change Mission Area of the USGS, which undertakes scientific research using monitoring, remote sensing address the effects of climate and land use change. The CLU provides the scientific foundation upon which policymakers, natural resource managers, and the public make informed decisions about the management of natural resources. Funding comes from the Land Change Science (LCS) Program to understand the patterns, processes, and consequences of changes using models to predict scenarios of future conditions, and conduct integrative, holistic assessments. Betancourt, Julio Luis, and Raymond Turner. 1993. “Tucson’s Santa Cruz River and the Arroyo Legacy”. Ph.D., Tucson, Arizona: University of Arizona. Fish, Suzanne K., Paul R. Fish, Russel Varineau, and Elisa Villalpando. 2013. “In Flight: Adriel Heisey’s Images of Trincheras Archaeology.” An Exhibition of Arizona State Museum and the Mexican National Institute of Anthropology and History. www.statemuseum.arizona.edu/exhibits/heisey/index.shtml. Seager, Richard, Mingfang Ting, Isaac Held, Yochanan Kushnir, Jian Lu, Gabriel Vecchi, Huei-Ping Huang, et al. 2007. “Model Projections of an Imminent Transition to a More Arid Climate in Southwestern North America.” Science 316 (5828) (May 25): 1181 –1184. doi:10.1126/science.1139601. Warshall, P. 1995. The Madrean Sky Island Archipelago: A planetary overview. In Biodiversity and Management of the Madrean Archipelago: The Sky Islands of Southwestern United States and Northwestern Mexico. General Technical Report RM-GTR-264. Tucson, Arizona: U.S. Forest Service. July. Below are science projects managed under the Aridland Water Harvesting Study. Desert marshes, or ciénega, are extremely biodiverse habitats imperiled by anthropogenic demands for water and changing climates. Given their widespread loss and increased recognition as important wildlife habitat, remarkably little is known about restoration techniques. Below are journal articles and reports published by the Aridland Water Harvesting Study. Wilson, Natalie R., and Laura M. Norman. 2018. “Analysis of Vegetation Recovery Surrounding a Restored Wetland Using the Normalized Difference Infrared Index (NDII) and Normalized Difference Vegetation Index (NDVI).” International Journal of Remote Sensing 39 (10): 3243–74. https://doi.org/10.1080/01431161.2018.1437297. Below are data releases published by the Aridland Water Harvesting Study. Below are news stories and announcements about the Aridland Water Harvesting Study. Laura Norman was asked to present her study of Watershed Restoration at the Arizona Section Summer Meeting for the Society for Range Management, "Managing for Resilient Rangelands in Southeast Arizona" by the Rangeland Program Manager at the Coronado National Forest. USGS scientist, Natalie R. Wilson, developed a successful proposal to receive field assistance from the Borderlands Restoration Leadership Institute (BRLI). Starting August 10th, BRLI has awarded a Fellow to assist in monitoring vegetation response to erosion control structures (ECSs) during the 2017 field season. Dr. Laura Norman presents "Ecohydrology of Aridland Water Harvesting"
Dr. Norman visited the USGS Menlo Park to provide a lecture describing her research with the Land Change Science Program. Soil erosion and land degradation pose serious threats to sustainable development of arid and semi-arid ecosystems. USGS scientists were asked to present their research to the U.S. Section of the International Boundary and Water Commission (IBWC) and their counterpart in Mexico, la Comisión Internacional de Límites y Aguas (CILA), describing flood magnitudes and real-time rain gage and hydrometric data for the Nogales watershed, in SE Arizona, U.S.A., and Northern Sonora, Mexico. Research scientist Laura Norman spoke with Alexander Devoid, with the Arizona Republic and provided information describing her research for an upcoming story about the restoration effort at Cuenca Los Ojos in Arizona, USA, and Sonora, Mexico. A questionnaire was developed that prioritizes values influencing social behavior and consumer choice associated with ecological restoration activities in SE Arizona. The goal is to systematically quantify community preferences about the environment in the context of economic demand, so they can be incorporated into local watershed management decisions. The Aravaipa Canyon Preserve of The Nature Conservancy will host Dr. Laura Norman, a Research Physical Scientist with the Western Geographic Science Center to speak to the newly-formed Aravaipa Watershed Conservation Alliance (AWCA) in Klondyke, Ariz,. at the old schoolhouse. The Friends of Sonoita Creek, an Arizona non-profit organization dedicated to protecting Sonoita Creek and its watershed hosted Dr. Laura Norman, a Research Physical Scientist with the Western Geographic Science Center. Laura Norman's watershed restoration presentation praised in local news! There was a full house at Cady Hall on Saturday, Dec. 17 to hear USGS scientist Laura Norman, PhD, talk about our water, the liquid gold of the Patagonia watershed. Her presentation was sponsored by the Friends of Sonoita Creek (FOS).